You can back up a Pro Tools session like any other file, but will it still be readable in 10 years' time? Here's how to make sure. I recently returned to some Pro Tools sessions recorded at least five years ago to find that some of the plug-ins I had used had become obsolete, or replaced by new versions which won't read the settings from the old versions. As a result, the mix no longer sounded anything like it should have, even though all the audio and media files were safely backed up. This got me thinking how I could protect my sessions against these kind of problems and take steps to future-proof them. Note that this article isn't about the actual archiving process itself, but rather the best way to prepare a completed project for archiving. If you want some tips and advice for backing up Pro Tools sessions and projects, take a look at our Pro Tools workshop from July 2007 (/sos/jul07/articles/protools_0707.htm); you might also be interested in the workshop on cloud-based storage for Pro Tools sessions in September 2011 (/sos/sep11/articles/pt-0911.htm). The first thing you need to do is to tidy up your session, if it needs it — and most do! Sessions often contain lots of material you are never going to use, such as rejected vocal takes and so on. You can either get rid of these by manually selecting and deleting them, or by using the Select Unused command from the Clip List menu. You can now approach the problem of making your session future-proof. The principle is to render all the plug-in sounds to audio, either by using AudioSuite or real-time bouncing, in such a way that you print processed versions of the tracks, but retain the flexibility of returning to the original unprocessed version if that is ever necessary. It's also vital to label everything — it may be years before you open the session again, and you won't remember it all. The first thing to do is to protect the session and save a reference version — you don't want to be making these changes to the only copy. So before doing anything, use Save Session As to save a version with the suffix 'Archive' or similar, which will serve as a basis for your renders and so on. The first screen capture shows a session as I delivered it to the mastering house. 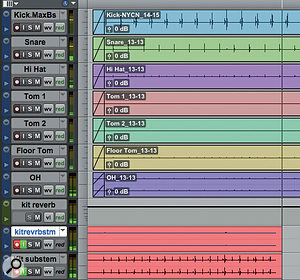 A typical Pro Tools mix containing the usual combination of audio tracks and Aux tracks with plug-ins. The question is how to make sure all of these sounds will still be available years from now! 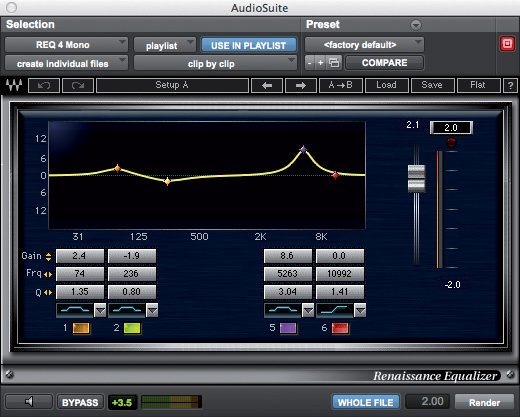 Note that there are tracks with a variety of plug-ins, as well as various aux sends. In this case, the first two sends were for headphone feeds, so as part of the clean-up I can remove these from the session. After that come several reverb sends. The kit reverb is already nicely labelled, but over on the right-hand side I have a send that is still labelled with its default bus numbers (13-14), so as part of the process of making sure that everything is labelled, I am going to give it a more appropriate name. Right-clicking on a bus name in the Mix window and selecting Rename lets you change the bus name without having to open the I/O Setup window. You could now just work though the session creating AudioSuite rendered versions of each track, but if you do, you will lose the unprocessed versions of these tracks, shutting down options for the future. To keep these options open, I use Playlists. Leaving the original version as the top Playlist, I click on the arrow button next to the track name in the Edit window and select Duplicate. Then I rename the duplicate with a name that indicates that it has been rendered, and which plug-ins were used. By creating a duplicate Playlist, you can render effects using AudioSuite, yet retain the unprocessed audio on the original Playlist. Now go back to the first plug-in on the track, click on the Preset drop-down menu, and before doing anything else, change the location of where Pro Tools saves the plug-in settings to the Session folder from the Root folder. This way, all plug-in settings relating to this session will be saved in a folder with the session, so if your system drive fails, or you have changed computers, when you come to retrieve the session you will have all the plug-in settings relating to it. (I haven't forgotten that the settings are saved with the session, but this gives you another layer of security.) For added clarity, take the opportunity to rename the settings from the plug-in Presets menu: this time, select Save Settings As and rename it appropriately — for instance, I use the song name, then the track name and plug-in name so it is clear exactly how the stored settings relate to the session. To transfer settings from the AAX, RTAS or TDM plug-ins to their AudioSuite counterparts, select Copy Settings from the plug-in's Presets menu to load them into the clipboard. Highlight all the audio on the track in question, go into the AudioSuite menu and select the corresponding plug-in, then open the Preset menu and choose Paste Settings. Your AudioSuite plug-in should now display the same settings as the real-time version, but there are some other options to consider before hitting the Render button. I recommend setting the AudioSuite plug-in as I have it in the screen, right The safest way to archive submixes and send effects is to record them to new stereo tracks.. Set the Files option to Create Individual Files, Clip by Clip instead of Entire Selection, make sure Use In Playlist is selected, and select Whole File at the bottom in case you want to use a different section of the file in future. If you don't do this, you'll only be processing the section of the file that's actually used in your session, plus any extra amount defined by the Handles setting. Now hit Render and Pro Tools will create new files rendered with the plug-in settings. If you have fade files, these will be included too, so no need to put them back either. 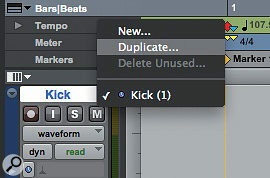 Finally make the real-time plug-in inactive by right-clicking on the plug-in name and selecting Make Inactive. If you only have one plug-in on a track you can now move on to the next. If, as on the 'Kick' track in this example, there is a second plug-in, I create another Playlist with the next plug-in (in this case Waves MaxxBass), and repeat the process. This way, you end up with a Playlist for each step through the plug-in chain, giving you the maximum number of options when you come to restore this session. As a 'belt and braces' option, you can also take screenshots of the plug-in windows showing the settings, which will help if you eventually find yourself having to recreate the same sound using a different plug-in. The AudioSuite/Playlist technique outlined above works very well for audio tracks — but what about Aux tracks? Processing applied to submix groups or using send effects can be a major part of the sound of your mix, so it makes sense to preserve this as audio. 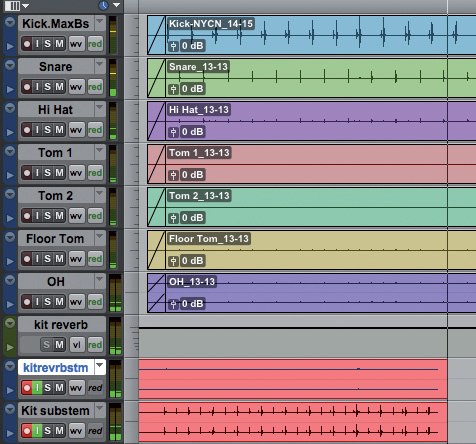 In the example session, for example, I have a 'Kit' submix with a dedicated reverb. To capture both, I need to create two stereo audio tracks with appropriate names so the 'kit reverb' audio track is 'kit reverb stem' and the 'kit sub' becomes 'kit sub stem'. Here, I've copied my EQ settings to the AudioSuite version of the same plug-in, and I'm ready to apply them to the whole file. Recording an Aux track is relatively easy as long as it doesn't have any plug-ins: simply set the input source on the new audio track to be the same bus that is feeding its Aux track equivalent. If the Aux track has a plug-in on it, though, or any automation, you will need to use two free buses to route the processed output to the new audio track. The same applies to virtual instruments. Once you've created all the necessary audio tracks, you can delete any newly redundant Aux tracks (ones acting purely as subgroups, without plug-ins or automation). Finally, put all the new 'stem' tracks into record and play the session through, and you will have stereo audio stems for all your subgroups and effects returns. Finally, do a Save Session Copy, as this will make sure that all the files for the project are brought together into one folder. From the Save Session Copy settings window, make sure you tick the Audio Files under Items To Copy. Leave Main Playlist Only unticked, because you need all the Playlists to be copied. Tick the Session Plug-In Settings Folder option, as that should now have all the plug-in Settings properly labelled. Then click OK, and name the session appropriately; this, of course, will name the folder as well. I use the suffix 'Archive' again so it is clear this is the archived version. Pro Tools will then copy all the files across into the new folder in the new location, and you will have your session properly archived and future-proofed as much as possible. Remember to save any plug-in screenshots in the final archived folder, too, so everything is together in one archive folder. Now you can put the archive folder onto a drive or volume and use a cloud-based service like Gobbler, if you don't have an off-site solution of your own. Remember the backup mantra: "it isn't backed up unless it is in three different places, one of which must be off site”!